W.T.J.S. 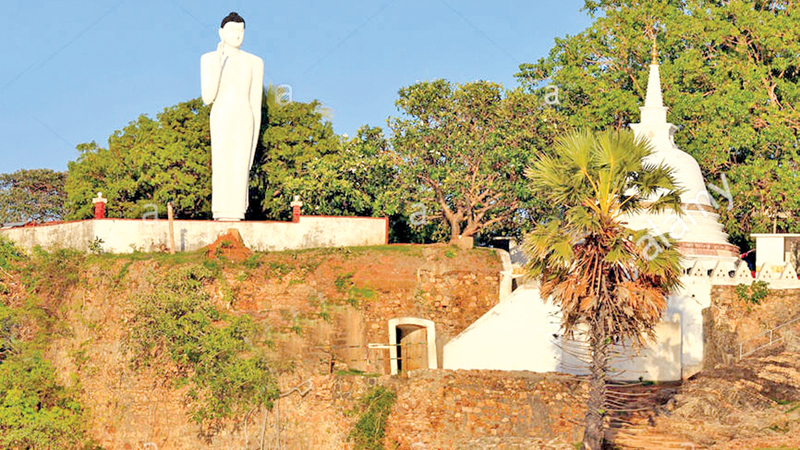 Kaviratne Ambalangoda Special Corr. Trincomalee is a unique city, rich in culture and religious places of worship. Most importantly, it is a crossroad where different ethnic groups have come to meet and live in relative peace. According to the 2012 Census of the Trincomalee District, it comprised 1,592,516 Muslims, 98,772 Buddhists, 98,133 Hindus and 21,893Christians. Thus Trincomalee is the ideal place to look at how reconciliation in this country would work and is practised. The Sarvodaya Peace Centre, the US-based Karuna Centre and the National Peace Council are the inter-religious entities effectively promoting ethnic harmony, peace and reconciliation in this pluralistic society comprising multi-ethnic, multi-religious and multi-cultural communities. Karuna Centre’s Susendra Wijenadan said close collaboration with the Sarvodaya Peace Centre in Trincomalee helped them conduct programmes on building peace and reconciliation. They also implemented numerous activities with the participation of all ethnic and religious groups. Tamil and Sinhala language classes are conducted in order to facilitate communication among the different ethnic groups. Inter-faith dialogue sessions have also been conducted within each the Divisional Secretariat. According to Wijenadan, since 1994, the Karuna Centre has been conducting seminars on skills and practices of conflict resolution and programmes promoting mutual understanding with the joint participation of other civil society organizations. He said the role of religious dignitaries had become a vital factor in promoting peace and reconciliation. These programmes, he said, would be important in creating unity and harmony not only among the different ethnic groups, but also between the different faiths. Rev. W. Thilakaratne of the Inter Religious Foundation said the war in the North and East was due to non-existence of inter-religious understanding. He said all human beings were not born as members belonging to various religions and ethnic groups but were grouped much later. If Sri Lankans had learnt to respect humanity and lived according to the teachings of their respective religions, the North-East war could have been avoided. “It is only through religion that people could seek truth which of course could remove ignorance. It was unfortunate that Sri Lankans failed to achieve peace and reconciliation even though our society comprises devotees of the major religions of Buddhism, Hinduism, Christianity and Islam,” he said. Rev. Thilakaratne quoting a Biblical verse said the gist of all religions is to love one’s neighbour as one loves oneself, and if we can do that, we will have reconciliation. Inter-Religious Cooperation for Community Development and Empowerment programs in both Trincomalee and Batticaloa have helped in developing mutual understanding and tolerant attitudes between different religious communities. These have also provided opportunities for devotees of diverse religious faiths to be engaged in community activities which promote reconciliation and harmony at the grassroots level. The four main religions in the country have had their own groups trying to promote ethnic reconciliation. 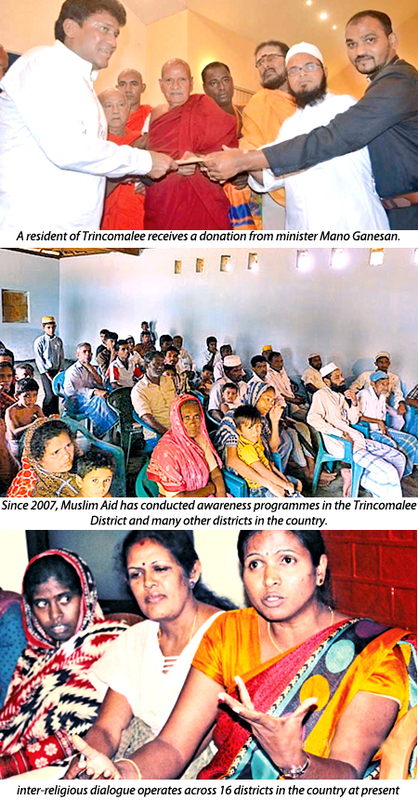 Since 2007, Muslim Aid has conducted awareness programmes in the Trincomalee District and many other districts in the country. They are part of the North-East Forum for Reconciliation (NEIFR) comprising religious leaders in Sri Lanka. In addition, the Presidential Task Force on Ethnic Affairs looks into ways in which relations could be improved between the ethnic communities. Research and Media Director of the National Peace Council (NPC) and member of Presidential Task Force for Ethnic Affairs, Dr. Jehan Perera said since the inception of the NPC, they have conducted numerous workshop and seminars among the different ethnic groups and faiths to promote peace and harmony. During the sessions of the district-level Inter-Religious Committees (DIRC), the participants are provided opportunities to discuss their grievances. In group discussions, participants made suggestions to resolve these issues. Dr. Perera revealed several success stories from DIRC: members during group discussions had even pointed out early warnings of volatile situations existing in their respective areas. In addition, with the assistance of Divisional Secretariats, identity cards have been issued to those who had failed to obtain IDs for the past several years. Dr. Perera said inter-religious dialogue operated across 16 districts in the country at present. Nine of the DIRCs are headed by Buddhist clergy while others have Hindu, Muslim and Christian clergy. Dr. Perera further said famous religious shrines played a vital role as the meeting grounds of devotees belonging to different faiths. Some of the participants of inter-religious groups however revealed that even though people of diverse religions gather together, they still found it difficult to mingle with each other. If there were activities where the mixed groups could participate together, it could prove to be more effective. According to them, monthly workshops and seminars on inter-religious dialogue were not so effective. The Jaffna Inter-Religious Group is a voluntary civil society organization comprising religious leaders from the Hindu, Christian, and Islamic faiths. In addition, civil society representatives, women’s groups and other social service organizations have joined the Jaffna Inter-Religious Group (JIRG). Swami Shiva Sri Somasundara Kurukkal, Bishop of Jaffna, Jamiyyaathul Ulaima, the Naga Vihara Chief Incumbent and Father Issac David Dixon founded the organization together with a few other members. The vision of JIRG is to establish a society that is free from ethnic, religious and caste division. Majority of the local tourists visiting Jaffna on pilgrimages from other provinces are unaware of customs of Hinduism. Sometimes the behaviour patterns of these visitors could create religious conflicts. In order to avoid such incidents, JIRG has intervened on several occasions to ease the tension between visitors and residents. Similarly, the JIRG annually organizes religious ceremonies to promote co-existence among major religions of Hinduism, Islam, Buddhism and Christianity. The JIRG also carries out exchange programmes for members of all faiths with people of the South. During the inter-religious programmes, in addition to religious harmony, participants are also made aware of transitional justice, human rights, the findings of the Lessons Learnt and Reconciliation Commission (LLRC) and case studies from other conflict-ridden countries on harassment, intimidation and other abuses, etc. It is hoped that these examples will motivate them to say ‘no’ to war next time around.